Victoria Swan tells how she used the spirituality techniques on the Chanting Channel to relieve an ear infection. New personal testimony reveals Victoria Swan’s personal story about how she used Dr. and Master Zhi Gang Sha’s new interactive Soul Healing Miracles ™ Chanting Television Channel for a few minutes at bedtime to heal a painful ear infection. Victoria tells how her ear infection hurt and how she decided to use an alternative medicine to heal her ear pain. 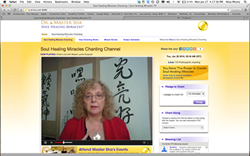 After hearing about Dr. and Master Sha’s Chanting Television Channel, she logged into the channel, requested a healing from the thousands of people chanting together online, chanted with the live chanting broadcast and fell asleep. “I am so grateful to the many tools that Dr. and Master Sha has given humanity,” says Victoria Swan. “ I did nothing else to enhance healing. I requested a healing on the Chanting Channel for my left ear and when I woke up, the ear was completely normal.” For the first time ever, Dr. and Master Sha bridges the world with a 24 hour a day, 7 days a week interactive Soul Healing Miracles™ Chanting Television Channel to teach others how to self-heal and join hearts and souls together to heal the world with soul-guided chanting through the teachings of sound therapy led by his Divine Channels and advanced students. To experience a personal transformation, go to the Chanting Channel: http://www.tv.drsha.com. In fact, chanting mantras has served millions of people for centuries and has been used in the African, Hawaiian, Native American cultures, as well as the Roman Catholic (Gregorian, psalms), Jewish (Cantillation), Muslim (Qur’an reading), Buddhist and Hindu religions for spiritual and healing arts, and ways in which people connect with God or the Divine. Today, billions of people recognize the benefits of chanting on the level of soul, heart, mind, and body. In a time when more people are looking to answers to life’s questions, Dr. and Master Sha is proving to be a popular choice. Dr. and Master Zhi Gang Sha is the world-renowned miracle soul healer. He has created thousands of soul healing miracles worldwide in the last ten years (http://www.youtube.com/zhigangsha). He is the founder of Soul Mind Body Medicine®. He was trained as a conventional medical doctor in China and a doctor of traditional Chinese medicine in China and Canada. The founder of the Institute of Soul Healing and Enlightenment™ and the Love Peace Harmony Movement™, Dr. and Master Sha is a grandmaster of many ancient disciplines, including tai chi, qigong, feng shui, and the I Ching. Master Sha is also an expert in the most advanced cellular healing science now occurring in China. In the West, he is involved in breakthrough research on the effects of spirit on the human system. Dr. Sha was named Qigong Master of the Year at the Fifth World Congress on Qigong. In 2006, he was honored with the prestigious Martin Luther King, Jr. Commemorative Commission Award for his humanitarian efforts. Dr. and Master Zhi Gang Sha has more than 100,000 followers on Facebook and an additional 250,000 devotees worldwide. The Soul Healing Miracles™ Chanting Channel fosters a soul healing community to learn and use chanting and soul songs for personal, spiritual, mental and soul development, 24/7. Dr. and Master Sha’s Soul Healing Miracles™ Daily Live TV airs everyday on Livestream, 9am PT, 12pm ET. Master Sha’s national television show, The Divine Soul Song Series airs several times each week across the US, as well as worldwide on on TelosTv.com’s worldwide digital network and http://www.DrSha.com. Everyday people all over the world are experiencing personal Soul Healing miracles and sharing their video testimonials so that others can benefit from these powerful and life-changing results on http://www.youtube.com/zhigangsha. Dr. and Master Sha is author of more than 10 books in the Soul Power Series published by Simon & Schuster (Atria Imprint), with each book reaching the New York Times bestselling list and four of them reaching #1. Master Sha’s new series, Soul Healing Miracles is published by BenBella with the first book entitled Soul Healing Miracles: Ancient and New Sacred Wisdom, Knowledge and Practical Techniques for Healing the Spiritual, Mental, Emotional and Physical Bodies. Released in November 2013, it was an instant national bestseller landing on the USA Today, Wall Street Journal and Amazon bestseller lists within days of publication. All of Master Sha’s Soul Power books, DVDs and CDs, reveal soul secrets, wisdom, knowledge and practical techniques to transform every aspect of life, and are bestsellers throughout the world. Visit Dr. and Master Sha on his website http://www.DrSha.com and http://www.facebook.com/DrandMasterSha to receive FREE daily Soul Healing blessings via webcasts, teleconferences 24/7 Chanting Channel, and in-person at events held throughout the world.